On The Wagon defeated the likes of Grade 1 winner Cobalt Creek while qualifying for the $837,262 Grade 1 Texas Classic Futurity at Lone Star Park. AUSTIN, IN—FEBRUARY 7, 2019—On The Wagon SI 99, a multiple-stakes-placed and grade 1 son of leading sire Pyc Paint Your Wagon has been retired from racing and will begin his stallion career this year at Southern Indiana Equine Inc. in Austin, Indiana. His fee has been set at $1,500. Breeders' who pay their fee in full by March 1st can take advantage of a $500 discount. Owned by Jerry Deville, Nathan and Amy Peoples, On The Wagon won or placed in eight of 15 career starts and earned $105,830. He finished second in the Firecracker Derby and Old South Futurity and was third in the Grade 3 Sam Houston Derby. On The Wagon was also a finalist in the Grade 1 Texas Classic Futurity, Sam Houston Championship Challenge(G2) and Texas Twister Stakes. 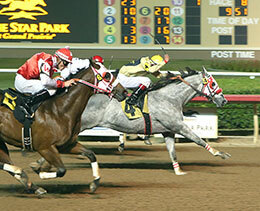 Bred by Michael Pohl, he is by Texas Classic Futurity(G1) winner Pyc Paint Your Wagon SI 107 ($889,581). Among the industry's leading sires every year, he is the sire of 102 stakes winners, 1 champion, earners of more than $32.6 million. Known as a "sire of sires", Pyc Paint Your Wagon's top performers include champion The Fiscal Cliff SI 109 ($580,425, AQHA Challenge Championship S.-G1, etc. ), Champion of Champions(G1) winner Mr Pyc To You SI 97 ($488,820), Heritage Place Derby(G3) winner Pyc Fun N Fancy SI 105 (to 3, 2018, $478,660), Remington Park Oklahoma Bred Futurity (RG3) winner Im A Fancy Pyc SI 92 ($454,765), Junos Request Stakes(G2) winner This Candys Awesome SI 105 ($434,265), A Ransom Handicap winner Wagon Tales SI 99 ($427,579), etc. On The Wagon's dam is the Grade 3 winning Stoli mare Xo Kate SI 115 ($242,302). She is the dam of 7 ROM from 7 to race, 4 winners, 3 black type including Grade 2 winner Game Changes SI 90 (4 wins at 2, $140,685, Hobbs America Futurity-G2), stakes-placed winner On The Wagon SI 99 (see above), Heritage Place Juvenile runner-up Stolin Wagon SI 96 ($27,086), Kates Game SI 92 ($13,883), etc. On Wednesday (Feb. 6) XO Kate's 2019 2-year-old Tf Kates Tlc posted the second-fastest schooling time from eight races carded at Remington Park in Oklahoma City. The second dam Streakin Kate SI 89 is a grade 1 finalist by leading sire Streakin Six. She is a sister to grade 2-placed Streakin Shannon SI 93 ($118,587) and half-sister to Grade 3 winner Silver Masquerade SI 112 ($56,352). She is the dam of 9 winners, 10 ROM, three black-type including grade 3 winner XO Kate SI 115 (see above), Grade 1-placed Dodadash SI 107 ($129,951, 3rd All American Derby-G1, etc. 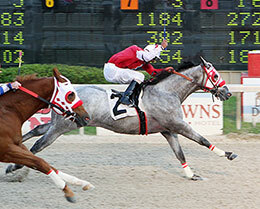 ), stakes-placed and All American Derby-G1 finalist Cashinon SI 102 ($58,987), etc. Streakin Kate is also the grandam or great-grandam of stakes winners Wave Good Bye Baby SI 105 ($115,257), Baby La Jolla SI 103 ($100,388), Oak Canyon SI 97 ($95,742), Babe I Like It SI 101 ($94,974), to name a few. For additional information or breeding contracts call Amy Peoples, DVM at 812-754-0341 or 812-595-0832.